Hand exercises help relieve muscle tension when writing. They are essential to learn if your child grips too tightly when holding a pen or pencil. They can be very helpful for children who have hypermobile fingers in their joints. Some people refer to hypermobile fingers as ‘bendy fingers’. 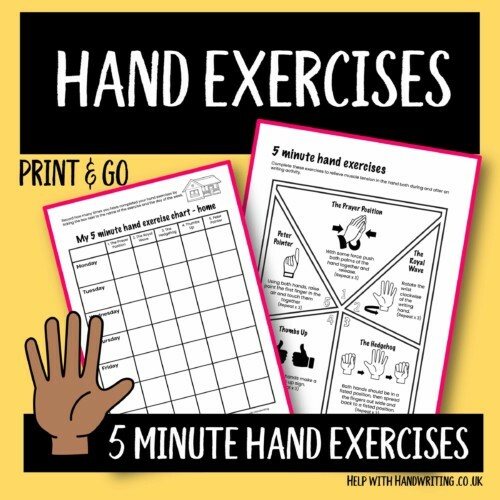 If your child comes home from school or after they have done their homework and said their hand is hurting then you need these exercise sheets. If your child says their hand hurts when writing then give them these quick and easy to do exercises. They are guaranteed to help relieve the muscle tension caused by gripping a pen too tightly.